Rarely bark especially when it is unnecessary to do so and often reflect the moods of their household or those around them. Requires commitment and effort in training, but if trained properly, they are happy, easy going and friendly. Require daily combing to prevent their wavy and thick coat from tangling. Like most dogs, their eyes and ears should be checked and cleaned on a regular basis. The soft coated breed of terriers, shortly called as Wheatens, originated from Ireland and is one of the oldest variety of terriers. Some believe the breed was brought to the US in the 1940’s but some pictures suggest they were brought here in the late 1800’s. They get along well with older children and other animals within the household through proper training and attention. Like most terriers, they easily develop close affinity with family members so they normally appoint themselves as watch or guard dogs. 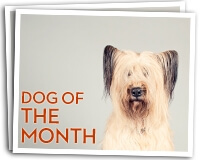 If you’d like to see images of a Wheaten Terrier that plays at Dog Day Getaway, check out Daisy the DDG Dog of the Month for January 2019!